Update the Annan and Silloth routes remade the docks at Silloth in extruded whole docks rather than seperate quays. Routes now all share the single folder. Removed animation from dock gates as bit of a gimmick. Ships share the single image for those moving. 3 drivable. Default vert sync 60. Will make more hopefully and set them on preset tracks. Not sure what to do with the Isle of Man route as future routes will be about 20km as this avoids replacing the seabed with 4 vertices seabed as mght make deep water channels later. Sorting thngs out then will change to the launcher. I wont be uploading routes yet until I change to the launcher. I have uploaded the launcher and the 3 main routes, iom,solway,silloth. Seperate zip files for textures folder and seperate zip file for each route. Further details on my site and the download links. I tested them and they all seem to install and run OK. Apparently you use Esc to close each route? Regarding making more routes I not sure about that. If I do I will remove the drivable functions and functions such as opening dock gates. All vessels will either be auto on preset routes using timeline or static. The site is about the past ages and bygone times the Blender made objects/routes are incidental as enables me to explain some of features of the past decades. It would need a proper OPEN SOURCE maritime simulator to make non commercial maritime simulations and that would depend on others to create it! I don’t think there is any interest in that on these forums as would depend entirely on others !? the exit key can be assigned in one line of code. what do you want it to be? Daedalus. It is mainly just for others once they download routes. At present using Esc in the instructions to leave the route. No problems. I am just keeping things as simple as possible. Trying to make another schooner and then will simplify vessels to move on preset routes and forget the drivable. Thanks Barry. Tried the launcher and tested the downloadable routes I made with 2.79b. All things considered, tried and tested and best bet for me to stay with 2.79b Also the choice now of launcher or download 2.79b the once. For now will keep the launcher as a back up alternative as tried and tested. Up to the user if interested enough in martiime, so we will wait and see. Best plan also for me to put route building on hold as at the present time I can’t see much point in renewng web site contracts. 2.79b is the end of the line, which is best for me as it has had its final update and won’t keep changing. Considering the alternatives. looking at 2.8 and downloaded latest ver. The mesh size on maritime routes is the most important factor. So using 2.8 opened the 20 km mesh of the river Wyre from 2.79b. So the maximum mesh size does not seem to be a drawback but no idea what to do next. Downloaded the 50meg help manual. I dont know what the maximum route size would be for 2.8. Twenty km. seem OK but maybe investigate up to 50 km. A lot of the routes can be a flat seabed plane of a few vertices like the Isle of Man I made at 45 km with 2.79b. As regards forum interests even if neglible or nil, I need to make the routes so they are mainly of interest to myself and they work OK.
Then as mentioned decide about renewing the domain contract in a few months. in the meanwhile I can put back the 3 routes online, up to Silloth and also Isle of Man. There are a few ways to make these routes so will also see what 2.8 has to offer…very slowly but at first sight not optimistic. I think first sight will be enough though as regards making maritime routes as my opinion has now moved on after a few hours with 2.8. The three routes are back online and looks like keeping to 2.79b will be more than enough for me and for the maritime world. The first 3 routes are reasonable and minor updates made. Nice, srry i havent been keeping up with your thread there are too many posts to keep up with but nice progress so far i see yr really passionate about Maritime Routes. Available for download at the time of writing. i) Isle of Man full island about 32 miles. Post removed as was no longer relevant. Downloads no longer available and further posts on hold. It is difficult on these forums as without some form of discussion I have no idea even if the routes are downloading OK, etc. However that is the format people want on these forums and as regard real life simulations…? I need to decide now whether to pack the website idea in or continue to show how Blender can be used to create maritime routes. Obviously not designed just for simulations but it is certainly possible to make them as, I have shown over the last two years. I will be keeping to 2.79b and possibly change to the launcher later for it. Better option might be rather than trying to include details of several routes on an evergrowing length of thread which I find tedious I will place them in completed games forum, each one a seperate, simulation as with games, but probably following around the UK coastline. Of cause simulations can never be completed as depends what details to add and can be never ending. Rather than critique which I don’t want you can always add your own ‘improvements’, but make sure you show a screenshot of what you have done and I might be able to include your ideas in future routes. To place them in the completed games/simulations forum I would have to rotate them once I reach 7 to 10 routes as I have to pay for the domain site and bandwidth. Each route would be posted seperately. The link on my site would show it active or not (i.e add one-remove one). The only restriction is not for commercial use, not for sale, the content and routes. I will post on the completed forum wen I put the routes back online. Routes will have a version date so if updated it will be regarded as a different route with a new version date. Trying to decide whether to close the domain site within a month or 2 when due for renewal. Not so much the cost but all to do with discussion, as that is what simulations are all about and real life. I also post on UKTS forms and have done for many years, although again it is mainly for train simulations although there is a seperate forum for Blender and ship simulators, most of the posts mine on both of those forums over several years. I placed the first 3 routes on the completed games forum but doubt if it will make a scrap of difference. Maybe time to start using the launcher that Daedalus made, as people on these forums and on ukts forum could then use it if I include it for download at the top of the route download links on my site. It is a great pity that the game engine was removed as it had a good basis for creating real life simulations, and when being improved UPBGE ran into difficulties? So back to listing here with just a list of the available downloads from my site, and will go through the textures folder to see what I can amalgamate to cover 5 routes at a time into 1 textures folder. Routes are made with 2.79b Blender which I will keep to as won’t be learning 2.8 or any other game engine. 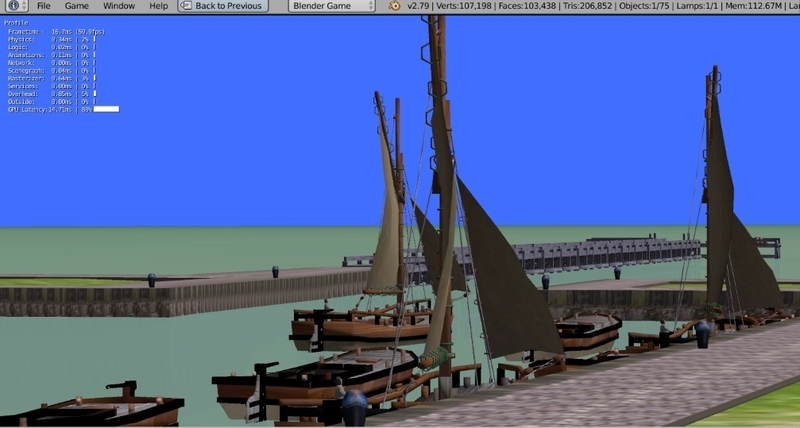 That has enough features to create simulations as I have made routes from 20 to 45km, working locks, drivable ships and boats, canals, etc, etc. To summarise currently the first 3 routes currentlly available for download. If the quantity of routes increases they will rotate if I continue with varying 7 available. 01 Isle of Man. 32 miles approx. 02 Annan harbour and Solway Firth. I will stick the link to the site into the side panel again. Press B to left of post. Mini screenshots on my site. I will keep them very small though to conserve bandwidth. There is no need to post further screenshots when downloads available. Maryport keys 1 and 3 open the seperate dock gates. Scenario could be open dock gate, take the schooner around to second dock, open the dock gate and berth. Scenarios can be as simple as where you position the vessels and could be endless if collecting cargoes, towing vessels or whatever. P.S. Working on route 5 but might take a while as 3 harbours in it. Workington, Harrington and Whitehaven. This then takes me out of the Solway Firth into Cumbria. When completed I will try out he launcher for the group of 5. I will decide in a month or so whether to close site or not. I have added the fifth route online that includes 3 harbours. Now I suppose most of the ‘posters’ on these forums, perhaps only have a tablet computer or maybe only an online phone maybe. I think to run simulations i would need more than a computer tablet. So with no feedback and discussion I have no idea ! So far the routes run fine on my 7 year old desktop computer and 7 year old middle range Nvidia card. With route 5 which leaves the Solway Firth now so might just continue leisurly, more for myself. I am unlikely to make more screenshots to show on these forums as the routes are there to download.Also that is what my domain site is for as there are mini- screenshots on that as there is a wider world than Blender Aritsts. Perhaps others could make some screenshots of the routes and show them on these forums as I have no reason to make more. I do not sell content. I do not sell routes. The routes are almost as open source, as they are not for commercial use and must not be used to make profit from them !! Also as simulations can never be completed I posted 3 of the routes on the completed forum but they can fit both forums. With simulations unlike games they can be continually adjusted, added to, corrected and even the different eras could create numerous versions. Endless scenarios can be created, etc, etc. I think as this thread is becoming endless I will start part 4, which will just list the available downloads with brief descriptions. If others then wish to post relevant screenshots of the routes I make, and are interested in maritime, it might help others of a similar maritime mind of any era. Critque not wanted discussion fine. Thread becoming too long so carried forward to Maritime World of Blender part 4. I am undecided about renewing the domain site in a a month or so.